These popular Las Vegas tours will blow your mind! There are so many attractions and excursions in Vegas as well as around it! This adult paradise is located very conveniently in the desert which is perfect for day trips, hiking or riding an ATV, and is surrounded by some of the most gorgeous recreational parks in the States. Not to mention the Colorado River where you could take a rafting trip, and Lake Mead for some boat cruising, and the engineering marvel that is Hoover Dam. 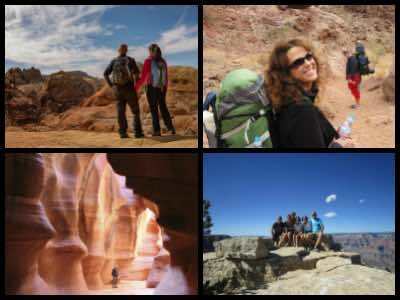 Below you will find some of the coolest guided excursions in and around Las Vegas, Nevada - have fun! 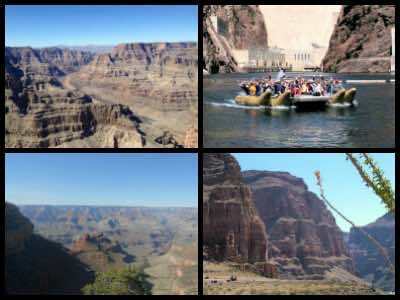 Some of the highly recommended Las Vegas Tours are visits to the magnificent Grand Canyon. There are so many ways to experience this natural beauty, via helicopter, small aircraft, Jeep, train or even river raft along the Colorado River! Step out onto the Skywalk Bridge and be captivated by the views from Guano and Eagles Point, the only place you will get a 360 degree view of the entire Grand Canyon. If you are a keen outdoorsman, hike the Bright Angel Trail along the Southern Rim of the Canyon. For extra fun, join a tour where you will ride in an ATV, all-terrain vehicle, along the Northern Rim. Then explore this amazing landmark from the river! Ride in a motorized raft or paddle on a traditional raft. Raft tours operate between April and October. If you prefer to relax, a luxurious Bus Tour will take you to the most scenic spots, all you need do is sit back and enjoy! If I had to name one must-do Las Vegas tour, the one that will leave a long lasting impression for years to come, it would be a helicopter flight to the Grand Canyon! No wonder that the Grand Canyon is one of the most popular tourist attractions in the world - it's beautiful, enormous and awe-inspiring! Wether it's your first visit to Las Vegas or you are a "pro", taking a helicopter tour to the Grand Canyon is a perfect addition to your vacation! A helicopter ride is an exciting thing you should do at least once in your life! And when is a better opportunity other than during your trip to the Sin City? All guided Las Vegas helicopter tours are conducted by top notch pilots who are also tour guides so you can learn a lot from them! While most helicopters fly to the Grand Canyon, there are also a lot of tours over Las Vegas Strip, which looks even more gorgeous from above! Take flight and experience the Nevada desert from high above the ground. 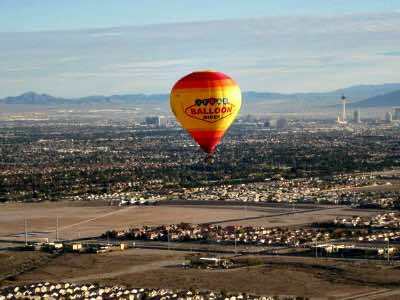 Taking a Las Vegas Tour in a hot air balloon will create memories to last a lifetime! Couples and newly weds must enjoy the Las Vegas Sunset Hot Air Balloon Ride, filled with romance and fantastic views. As the sun kisses the horizon, look out for the famous Vegas strip flickering to life. Feel a sense of calm as you drift over the valley and admire the views of the Red Rock Canyon and the Red Rock Mountains. Your tour lasts for one hour and offers panoramic 360 degree views while you relax and enjoy a glass of bubbly. The Sunset Tour is seasonal and operates from December to February. For the whole family, the Las Vegas Hot Air Balloon Ride offers a fantastic day outing with the thrills of 'Walking with the Winds' as you drift over the most astounding scenic views. 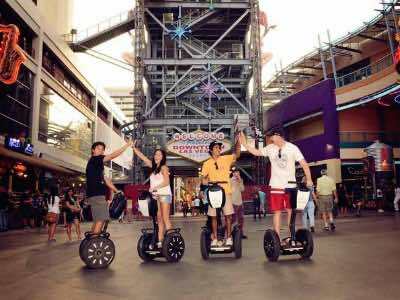 If you have never experienced a Segway, these Las Vegas Tours are for you! Zip around the city that never sleeps on a motorized two-wheeler that is easy to operate, fun and safe. A quick safety briefing is given before you set off. Discover Fremont Street, home to the Downtown Container Park, the Mob Museum, historic casinos and more. Follow your knowledgeable guide who will give you the insider scoop on the streets of Las Vegas as well as its rich history. Look out for the memorable Elvis-inspired wedding chapels as you approach the Fremont Street Experience, a five-block gaming and entertainment building complex. Be captivated by the sites and the sounds of the gaming machines, pinging away while people shriek with delight, counting their winnings. See the famous locations of the TV series Pawn Stars on the History Channel and then head off to the Charleston Art District for a taste of culture. Tours last about 2 hours and include hotel pick up and drop off. 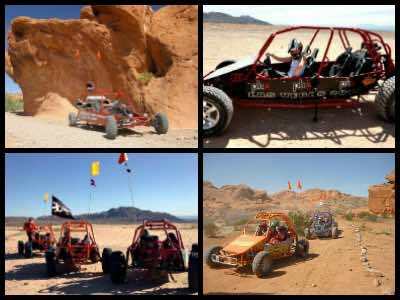 Extreme sports lovers will find an exciting choice of Las Vegas Tours that offer rides in Dune Buggies. 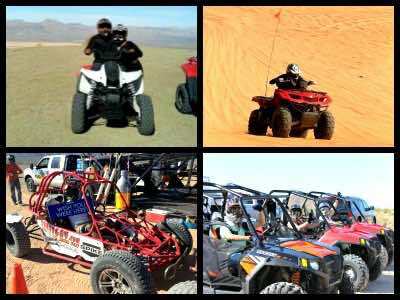 Hit the Vegas Dunes, zooming over the sand in these four wheel vehicles. Riding in a buggy for two or taking the wheel solo is one of the fantastic, adrenaline filled things to do in Las Vegas. Have fun as you chase your friends across the Nellis Dunes in your own dune buggy, churning up the sand with every twist and turn. Test your driving skills at Rattle Snake Cliffs and Lookout Dune. Then head over to the Valley of Fire State Park which offers some of the best off-road driving experiences on the planet. The four hour trip takes you past incredible rock formations, sand dunes and cliffs and stops to view the Bighorn sheep. For those who wish to chase the setting sun, take the Mini Baja Chase After Dark Tour where you will experience the Las Vegas desert at night. Enjoy a good spooky spine-tingling story? Then you need to join a Las Vegas Tour that explores haunted, eerie areas of the city and surrounds. Experience the paranormal as you venture to some of the most famous haunted places in the world. Head to Area 51 and get up close with one of the most secretive research facilities. For the brave, discover the 100 year old Pioneer Saloon where you will be locked down and given ghost hunting equipment. The Saloon is haunted by a number of ghosts, who may surprise you with their presence. Look out for the Crying Girl and Ruby's Ghost! Combine ghost hunting with extreme sport and head to Techatticup Gold Mine on an ATV. The mine is believed to be haunted by lonely ghosts of souls that died underground. These tours are not for the faint hearted! Be captivated by the iconic flickering lights that come to life after dark. A Las Vegas Tour at night is a must-do in the city that never sleeps. 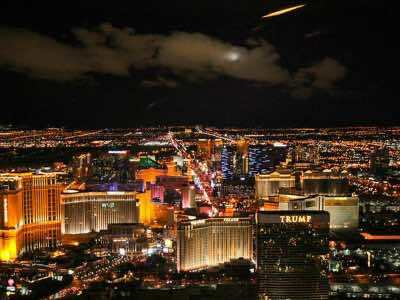 Whether on a bus, helicopter or on foot, Las Vegas at night time will thrill the most experienced travellers! Hover over the magnificent Hoover Dam in a helicopter as evening descends and then fly back in time to see the Vegas Strip light up. Back on the ground, take a limo complete with photographer and feel like a celebrity as you drive down the iconic Las Vegas Strip. For those who prefer to relax, a luxurious coach with ample leg-room and huge windows will offer a night-time view of the city in total comfort. Sip champagne and enjoy the Fremont Experience Light Show. For something different, join the Vegas Mob Tour where you will follow in the footsteps of notorious gangsters, mob bosses and visit scenes of gruesome murders! Zoom through the streets on a Las Vegas Tour that offers a ride on a scooter, a trikke or a moped. These fun vehicles are easy to navigate and a safety briefing is given before setting off. Small groups make the tour intimate and fun and your knowledgeable local guide will keep you entertained along the way. Tours range from one to five hours and cater for all levels of fitness. Head to Red Rock Canyon on your scooter and enjoy the wonderful scenery around you as the wind whips your face. 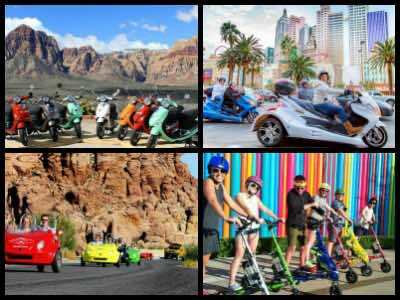 Swop your scooter for a trikke and head downtown and experience the iconic Las Vegas Strip. See the location of the TV show Pawn Stars and soak up culture on the Life is Beautiful Art Murals Tour. End your day on the Hoover Dam Trikke Tour filled with photo opportunities and break taking scenery. Sweet lovers will delight in the Food Tour where you will see the world's largest chocolate fountain! Saddle up and enjoy a Las Vegas Tour on horseback. You can chose from either a morning, lunch-time or sunset ride, all certain not to disappoint. Start with a full blown western style breakfast or sip champagne as the day ends! 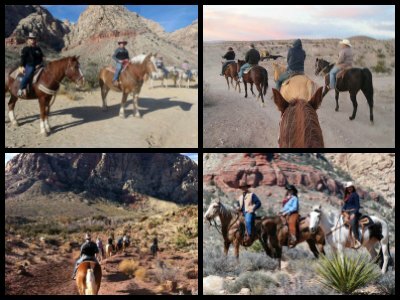 Head to Red Rock Canyon and feel like a true Old West Cowboy. Guide your steed along the Ol’ Spanish Trail, the 19th century route from Sante Fe to Los Angeles. For those who prefer to ride at dusk, chase the setting sun while enjoying the tranquil scenery all around you. Dismount and spend the rest of the evening enjoying a traditional cowboy cook-out. Combine a horse ride with some ghostly encounters in Nelson Ghost Town where the infamous Techatticup Gold Mine is found. Tours are suitable for ages seven years and up. Wear comfortable clothing and a hat for the sun. Experience the waters in the heart of the Nevada desert. Take a cruise or boat ride on a Las Vegas Tour and add to your list of memorable experiences to talk about when you get home! Enjoy the perfect evening with your loved one on an electric Gondola Ride on Lake Las Vegas. Take a romantic tour of Hoover Dam with the Lake Mead Cruise, where you will enjoy a fine-dining dinner served on-board. Looking for something to do during the day? 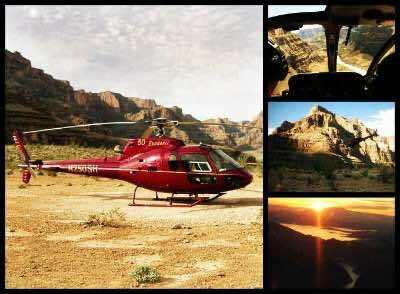 Take a helicopter tour of the Grand Canyon with a Colorado River boat ride afterwards where you can enjoy the stunning scenery while sipping a glass of champagne. Many water tours also include admission to the Skywalk as a stunning end to the day. Water Tours range from three to seven hours and cater for romantics, families and groups. Are you a film buff? Taking one of the amazing Las Vegas Tours that are themed based is certainly the perfect thing to do! 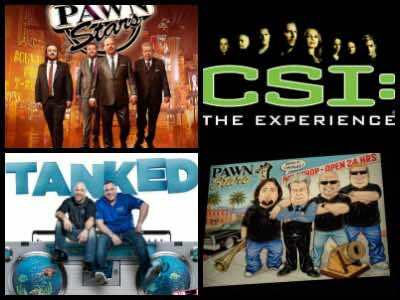 Get off the couch and go behind the scenes of some of the world’s most popular television series including CSI, Tanked, Car Lovers and Pawn Stars. 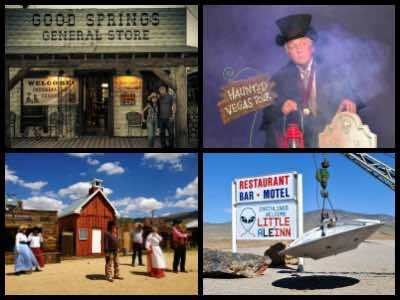 Once you have received your television fame fix head downtown and discover some of the most haunted places in the world including the Pioneer Saloon in Goodsprings. For a little bit of cultural enlightenment enjoy some of Las Vegas Museums, one that includes a detailed account of the Las Vegas Mob culture. Budding crime investigators will be thrilled by the CSI themed tour where you will be asked to investigate the scene of a crime and solve it! End the day exploring Wayne Newton’s Casa De Shenandoah, a legendary property spanning over 21 hectares. 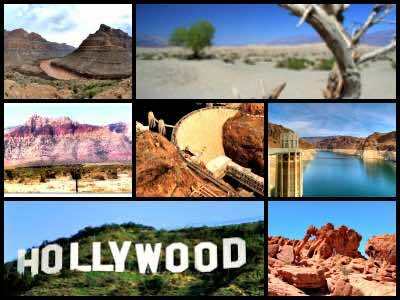 An exciting range of hiking and Las Vegas Tours will delight lovers of the outdoors. Grab your hiking boots and spend a day out in the Nevada sunshine. Take the Black Canyon Hike and Desert Hot Springs Day Trip from Las Vegas where you will hike along the Colorado River to the Arizona hot springs. Splash and soak in the natural mineral filled water, renowned for offering healing properties. Head to Red Rock Canyon and hike through the Valley of Fire. If you have a bit more time, take one of the three, five or week long day camping trips and experience famous places such as Bryce Canyon, Salt Lake City, Grand Tetons, Monument Valley, Zion, Yellowstone and Snow Canyons. World class lodging is offered with local guides who know their way around the region, offering you an unsurpassed experience. Feel the wind in your hair and a rush of adrenaline as your zoom high above the forests and deserts jumping from platform to platform. 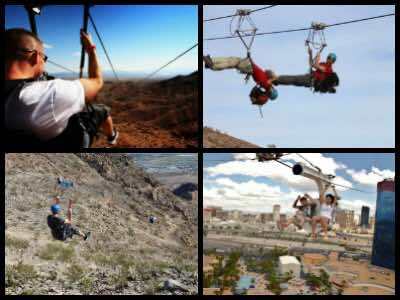 Las Vegas Tours including ziplines will thrill those looking for an adrenaline rush. For nature lovers, take the Bootleg Canyon Zipline Tour. Located at the base of Red Mountain, 3800 feet high, you will set off from the first platform. Be captivated by the dazzling scenes of the Nevada desert below as you zoom over fascinating and strange eco-system. For city-lovers, head to the Rio Hotel and Casino and take off on the VooDoo Zipline located on the 50th floor of the Masquerade Tower. Get strapped up and zoom 800 feet, high above the city, to the Ipanema Tower. The sight of the city below you is dazzling and is equally as stunning at night! Then make your return back at 25mph and stop for a drink to calm your nerves. If you are looking for unique guided Las Vegas tours or things to do, try shooting a machine gun at one of these popular gun ranges! many tourists claim that this is the most awesome, must do experience in Vegas. Whether you are new to shooting automatic weapons or are a pro, there are great packages for you. Many of the shooting ranges are located on or near the Strip, with one outdoor gun range located in the nearby Arizona, accessible via regular a shuttle tour. Las Vegas tours by ATV, are among the most popular, must-do things you shouldn't miss on your trip ! Both beginners and experienced riders will get an adrenaline kick while kicking the dust on an ATV or an RZR at the Nellis Dunes or in Valley of Fire - one of the most incredible valleys in the world! Las Vegas tours by Pink Jeeps are also among the most popular excursions in the city! Pink Jeep Tours is a tour company that uses high performance vehicles built specifically for sightseeing. These vehicles are a cross between off road jeeps and luxury SUV. Thanks to their innovative design, Pink Jeep Tours can get to the places where buses can't and are otherwise accessible only by air. The Tour Trekkers seat 10 passengers, and are therefore more intimate than buses. Not to mention that they are extremely comfortable - especially the 9 seats in the back! Although sitting at the front passenger seat, you will get a better front view. Thanks to their enhanced off-road performance, Pink Jeep Tours can get to some bumpy places where buses don't go! There are guided Las Vegas Pink Jeeps tours to the Grand Canyon, Hoover Dam, Red Rock Canyon, around the city, and even Death Valley. 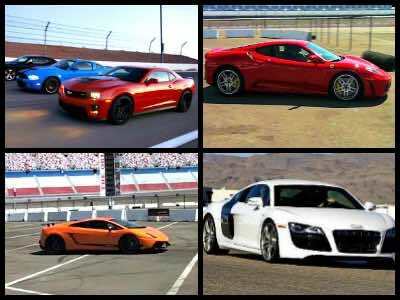 Exotic and races car driving experience is among the most unique Las Vegas tours. Who doesn't dream about getting behind the steering wheel of a Ferrari or Lamborgini? This dream can easily come true in Vegas! Las Vegas Motor Speedway has a fleet of the most luxurious exotic and sports cars in the world and it offers exciting tours around the track and even to the Red Rock Canyon. 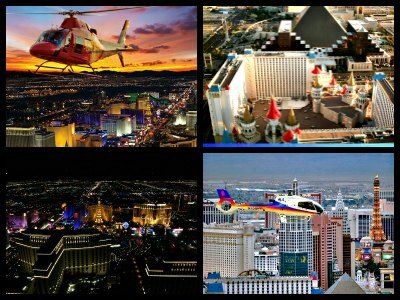 There are several kinds of Las Vegas tours by airplane. 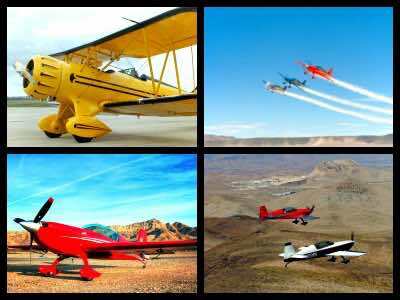 There are fixed wing airplanes flight to the Grand Canyon, there are Waco Biplane tours over Las Vegas valley or Hoover Dam with optional aerobatic flights, and there are Air Combat experiences where you can actually learn to fly a small aircraft and even compete with your friends! If you aren't ready for the extremes, or if you have little kids with you - check out the Simulator - it feels as close to the feeling of flying an airplane as it's possible. Want to treat yourself or your loved ones to something special, or just feel like a VIP? 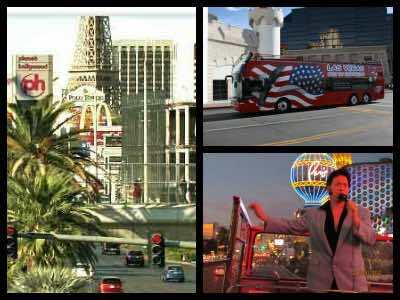 Try one of guided Las Vegas tours by limousine! 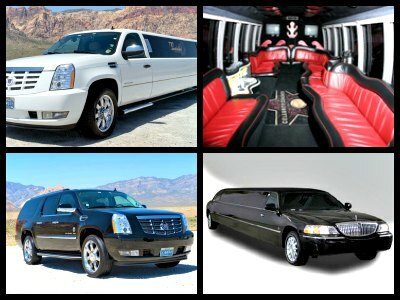 Presidential Limousines will make your vacation extra special, whether you decide to just ride around Las Vegas in a limo, or venture outside of the city to the Hoover Dam or the Grand Canyon in a luxurious comfortable stretch limo. Here you will find the best Las Vegas tours and excursions within the city's limits. We've included information about Las Vegas Strip tours in a limo, tours of downtown, sightseeing during the night and the day, Gondola rides at the Venetian, as well as a few "theme" tours. You will find, for example, Pawn Stars Tour, Mob Tour, Historic Hartland Mansion, Haunted Vegas Tour and Show, among others. 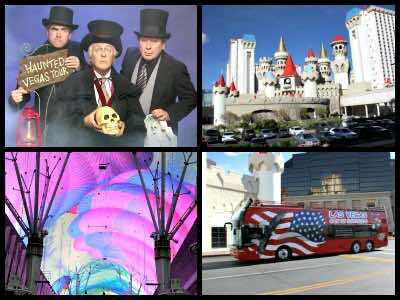 Guided Las Vegas tours by bus are extremely popular in the city - perhaps because bus is the cheapest option to travel in and around the city. There are plenty of sightseeing bus tours, as well as trips to the Grand Canyon, Hover Dam and other popular destinations around Vegas. Fancy a bite to eat? Enjoy some fantastic world class Las Vegas Tours to experience hidden-way authentic eateries, sample local dishes, meet the chefs and even try your hand at creating a dish! Head off on a 3-4 hour walking tour that visits six of the best restaurants and speciality taverns. Snack on delicious entrées and sip on unique taste bud tantalizing cocktails. Save some space for dessert, you will not be sorry. As evening falls, head to the High Roller, the world’s largest observation wheel and view panoramic views of the city. This tour is for over 21's only and offers access to a full bar for the thirty minute ride. For a fun family day outing, the Downtown Las Vegas Food Tour is a perfect choice. Visit the famous Beef Jerky Store and the ChillSpot for a frozen treat. 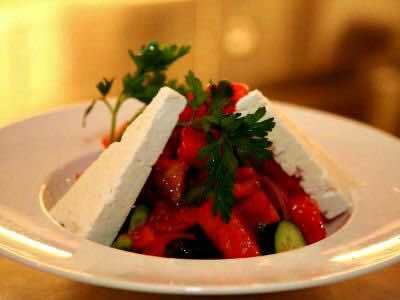 Try some speciality Vegan food at Simply Pure and learn all about the food culture of Vegas from your funny and knowledgeable personal guide. 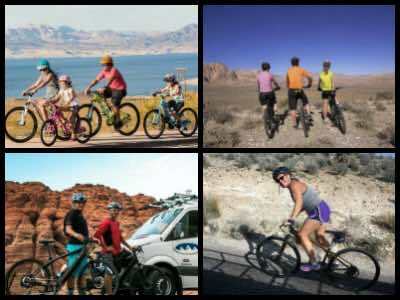 Grab your mountain bike and join a Las Vegas Tour that caters for bike fanatics! Cycle along the world class trails of Bootleg Canyon complete with incredible views. Head to Red Rock Canyon for a more advanced ride. This tour offers the chance to experience a Specialized Electric Turbo Bike over difficult and challenging terrain. Cycle along Mustang Trail, testing your skills along the rocky paths. End the day in tranquillity by cycling along the Hoover Dam, with feeling of cool air kissing your skin. This trip is suitable for the whole family and all levels of skill. Combine history and cycling as you ride toward Lake Mead along a historical railroad that was used to carry people and materials to the Hoover Dam. Discover the rich culture-filled Vegas streets on a walking Las Vegas Tour. Walking tours offer a relaxed and close-up experience with a local knowledgeable guide who will entertain you along the way. Head downtown and learn about the history of the iconic Fremont Street. Be captivated by the glittering casinos, famous Vegas personalities, incredible neon signs and movie scenes. See the famous Mob Museum and the Downtown Container Park. Those interested in Pop Culture will enjoy a themed tour that is filled with history and architecture. See the famous Neon Cowboy, historic casinos and the Mob Museum. This exclusive tour caters for small groups and end at the El Cortez Casino Hotel with a complimentary cocktail. All the walking will certainly work up your appetite so join the Las Vegas Strip Evening Food Tour and enjoy some of the best cuisine Sin City has to offer. Discover five world-class eateries and enjoy the delicious dishes on offer as the sun sets in the distance and the Vegas lights flicker to life. Spend a couple of days touring some of the most iconic sites in Nevada on a Las Vegas Tour that spans more than one day. Experience amazing sites such as the Grand Canyon, Zion, Bryce Canyon, Yellowstone and Monument Valley over three to seven days. 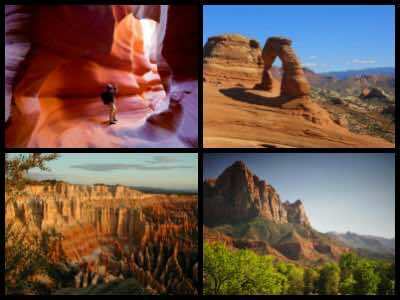 For a private experience spend two days surrounded by the unique scenery of Antelope Canyon, Horseshoe Bend and Lake Powell. Visit Big Water Dinosaur Center, a real treat. Grab the family and head to Anaheim, home to Disneyland California. Experience the thrill of the fun park and be reminded of the magic of your childhood. Spend a day splashing about in the Vegas waters. 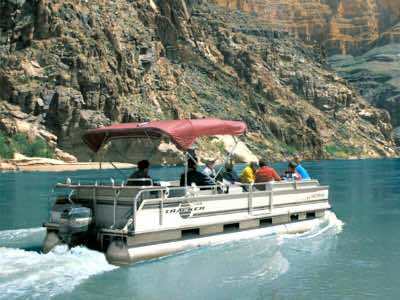 Las Vegas Tours themed around water are fun and entertaining for the whole family. Head out on an adventure with the Black Canyon River Rafting Tour and enjoy the incredible scenery that surrounds you. Navigate your way through the rapids as the massive towering cliffs rise up on either side of the river. Then swop your raft for a kayak and experience the Colorado River solo, a perfect time for self-reflection and finding your inner self as you admire the stunning scenery. More of the thrill-seeking type? Head to Lake Mead and zoom over the water via jetski. Then pretend that you are a superhero and stand on a flyboard that will shoot you into the air and allow you to hover above the water. When you get control of your nerves, learn how to do tricks and make sure someone is taking photos! Club crawls are so much fun! If you enjoy nightlife, clubbing and bars - you can't find a more fun place to be than Vegas! Hit the best nightlife spots in the city with these popular Las Vegas tours.